Whenever Tamerlane the Great was bored with his bowing courtiers and their everlasting, "Yes, my lord," He found relief in the companionship of Nasr-ed-Din Hodja. Here was a man who treated peasant and emperor alike. Here was a man who did not weigh every word before he let it reach his emperor's ears. Being with the Hodja was to Tamerlane like a fresh breeze from the mountains. It was a sunny spring day when Tamerlane asked Nasr-ed -Din Hodja to go with him to the plain, where his soldiers were at their archery practice. The Hodja had been planning to plant onions that day, but he needed no urging to put off that back-breaking job till another day. It was the sort of vivid, bracing day when a man feels twice as strong and clever as on a drab day. With each step across the fields to the place where the soldiers were practicing, Nasr-ed-Din Hodja felt younger and braver and more bursting whith all sorts of skills. By the time they joined the soldiers, he was no longer the old man at whom all Ak Shehir loved to laugh. He was Tamerlane's fearless companion, a man who could do anything. "A good shot that," said the Hodja as a soldier's arrow pierced the bull's- eye of the target." It reminds me of the way I used to handle a bow and arrow." "Really?" Tamerlane looked at the Hodja in suprise. "I had never heard that you were an archer." "Oh, yes, indeed! I was a famous archer." On a day like this the Hodja could be anything. "I remember how men used to come from distant cities to see me shoot. My hands itch for the feel of the bow again." No sooner was that wish out of the Hodja's mouth than Tamerlane beckoned to a soldier. "My soldiers need to see some good shooting," he said as he took the bow and arrow from the man. "Here is your chance to show us how it really should be done." Tamerlane held out the bow and arrow toward the dumbfounded Nasr-ed-Din Hodja. "Oh, you must not rob your soldier of his chance to practice." The Hodja was thinking faster than he had thought in many months. "He needs it so much more than I do." "Watching your skill will more than make up for the time he loses." 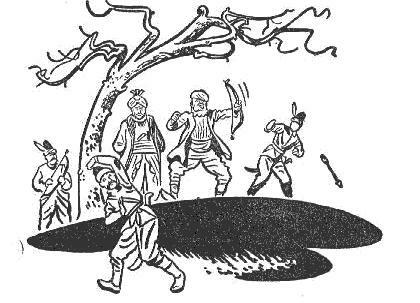 Tamerlane still held the bow and arrow toward the squirming Hodja. "It is so long since I have worked at archery," hedged Nasr-ed-Din Hodja. "It might be better not to do it today." "Oh, it will come back to you as soon as you feel the good strong bow in your hands." Tamerlane set the arrow in place, pulled back the bowstring,and sent the arrow whizzing within two hairs of the bull's-eye. "See! it is months since I have touched bow and arrow, but I feel as though I had been shooting yesterday." "Perhaps I should wait until this cut on my finger heals." The Hodja tried to shift the interest from archery to a little scratch on one finger. "That finger does not have to touch either bow or arrow," persisted Tamerlane. "You forget the pain in my shoulder which has been bothering me all winter," mused the Hodja, grasping for anything to keep that bow and arrow out of his hands. "You said this morning that today's spring sunshine had baked out that pain." Tamerlane held the bow and a fresh arrow firmly toward the Hodja. Nasr-ed-Din Hodja knew a command when he saw it - and a command from Tamerlane was a command indeed. "Oh, of course!" The Hodja tried to conjure up a jaunty air as he took the big bow in his awkward hands. A quick glance at a soldier at target practice showed him which way to hold it. After two or three tries he had the arrow fitted into somewhat near the right position. He squinted painfully at the target, pulled back the bowstring, and shut his eyes as the arrow wabbled limply to the ground just a few inches from his feet. Tamerlane expected to see the Hodja angry or embarassed. Not at all! The old jaunty grin suddenly spread over his face. "That," said the Hodja, is to show you how your Chief Huntsman shoots." Nasr-ed-Din Hodja took another arrow from the soldier's quiver. He beamed pleasantly at the little group of soldiers that was fast gathering about him and Tamerlane. He put his arrow in place, gave a mighty pull on the string and sent the arrow whizzing high into the air. Half a dozen soldiers jumped aside so that it hit no one as it fell to the ground not far from its starting place. "And that," said the Hodja with a cheerful nod, "is to show you how your Governor shoots." Nasr-ed-Din Hodja took a third arrow and adjusted it. The soldiers drew back ready to dodge in any direction. It was well that they did for the third arrow went far to the right of the mark. "And that," said the Hodja genially, "is to show you how your General shoots." Nasr-ed-Din Hodja took a fourth arrow. He no longer bothered to squint at the target. He merely put the arrow to the bowstring, gave a yank, and let it go where it would. This time the arrow left his bow with a businesslike buzz, whirred straight between the rows of grinning soldiers, and lodged neatly in the exact center of the bull's-eye. For a minute, the Hodja stared with open mouth and popping eyes at his arrow quivering in the bull's-eye. "Mash Allah!" he muttered. "Mash Allah!" Then his old poise came back. "And that," said he, as unconcerned as you please, "is to show you how Nasr-ed-Din Hodja shoots."